Couldn’t resist an entry for the 100th edition of Carnival of Genealogy. Congratulations to Jasia of Creative Gene on this milestone! One in Every Family is the theme. We are encouraged to write about special individuals, family heirlooms, or “interpret as you like.” I’ve interpreted the theme loosely as One in Every Generation (of the family). Part of the family history fabric for me is to see a pleasing characteristic or skill appearing in one generation after another as a recurring sort of genetic inheritance. Sometimes the evidence is not so pleasing! Granted, none of us can expect to live long enough to witness such interesting developments more than say three-four generations. But we can record what we see now, so the present youngsters can make future additions ... extended family, are you listening (reading)? Certainly there are recurrent threads (genes?) in branches of my family history. Shades of a Carnival of Genealogy theme about two and a half years ago! Some recurring characteristics are fairly easy to spot, such as noted then in my red hair monologue. Old photographs can be helpful to confirm physical attributes of ancestors we ourselves didn’t know. Mental and psychological traits in long-gone relatives probably depend only on rather unreliable anecdotes; nevertheless, a cousin and I did capture memories and observations of less perceptible but recurring characteristics ... another post, another time. Having turned this Carnival subject to my own ends, I address the stated theme! Victor Carl Freiberg lived most of his life in Port Arthur, Ontario. He was a blue-collar working man who found a niche at the mighty Provincial Pulp and Paper Mill. That was after a few stints at rough railway building in Northwestern Ontario and unsettled years of moving back and forth to Blind River in the pulp and paper industry. And those years were after a harrowing flight from his native Latvia at the age of twenty-one. 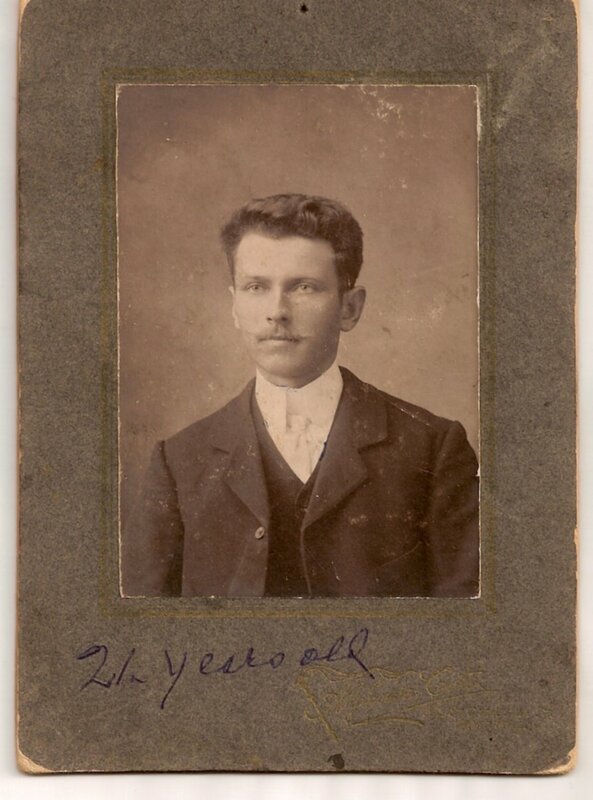 Born Victor Karl Freibergs in 1884, he and his three siblings had a good life. His father had a prosperous farm with sub-tenants on the Marzingshof (Mārsnēni in today’s Latvian) estate in Riga District, province of Vidzeme, Latvia. His father was also an influential member of the local Kastrāne parish council. As a young man Victor was vigorous and strong, with a special pride in his horses (the experience served him well for handling horse teams during a Canadian winter of hauling logs for railway ties). Then the 1905 uprising in the Russian Empire changed his life forever (see this for his father’s story). After his unhappy exile, Victor apparently never entertained a wish to return to his homeland. He was not pleased when his insistent wife left for a six-month visit during the euphoric 1920s days of Latvia’s freedom. A relatively uneventful life in Port Arthur suited him. Grandchildren were bounced on his knee as he recalled bits of old Latvian songs—the best part was when he imitated the musical instruments. He did not achieve total fluency in the English language but it didn’t hamper his self-expression. He found his second nature—and at times would wax poetic about nature’s pantheon—in gardening. 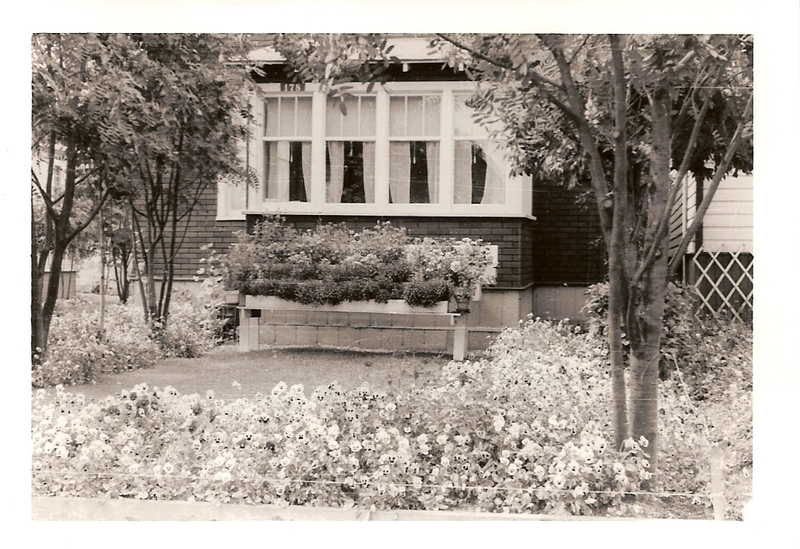 He turned the garden of his modest home into a summer showcase. Several times he won civic garden tour awards that gave him enormous satisfaction. Sadly, my inherited old photographs don’t do justice to his labours. My assisted research efforts with Latvian records and kin now show that Victor’s grandfather, Ansis Freibergs, also had dedicated horticultural interests. His descendants still take pride in the trees he planted over 150 years ago. In retirement life Victor loved his strolls downtown, critically inspecting all the gardens along the way, to socialize with the other old men. The “regulars” would sit on park benches with their faces lifted to the sun, exchanging amiable words now and then. The corollary to this quiet story is the gardening gene that pops up again. A grandson has it in spades (pun intended), nurturing a greenhouse with spectacular flowers and vegetables. A great-granddaughter has it—actually trained to maximize the interest—eventually making her own home a blooming delight. Five generations along from Ansis Freibergs. And likely more I don’t know about. Egad. Something so very satisfying about seeing a gentle, creative family legacy unfolding before your very eyes! Family History: Truth or Fiction? Which is stranger, truth or fiction? In family history, the real question is which survives longer or stronger? That depends, bien sûr, on two things in every generation: the level of interest among assorted family individuals, and the abilities of a family historian. One of my main blog goals has been to reach extended family members who feel the occasional curiosity regarding their antecedents, their cousin relationships, or perhaps their biological inheritance. Now I’m seriously questioning this goal. Not that I will stop my mission, because family history contributes a much wider significance to the grass roots of ALL history. The necessary mental gymnastics themselves are a singular challenge and satisfying reward. My particular subject of the moment is Family Stories—a special source my fellow genealogists will recognize at once, rolling their eyes. We have other terms for the same concept: derivative sources, oral tradition, family legends, family lore, hearsay, word of mouth, and so on. My personal favourite is mythinformation, a coinage oh-so-suitable for historical/genealogical permutations. A few generic stories seem to cross all ethnic and genetic boundaries in the New World ... e.g., the Indian Princess ancestor, or The Three Brothers who arrived to go their separate ways, just waiting for us to hook them up again. By the time you reach the bottom of this post you will get the connection between the aforementioned goal and mythinformation. Stories of the olden days are often what capture us to first explore our unique piece of history. Some ancestors were more colourful than others. Their exploits and events—heroic or scandalous—tend to alter as the years go by. Parts of a story get embroidered or censored. Bits get added or omitted. Sometimes the years blur two ancestors into one person. By the time a few generations pass, we researchers understand that it takes a certain amount of the proverbial salt to digest the stories. It’s like that old parlour game with a circle of people. The first person whispers a fairly simple statement into the ear of the next person. The second person whispers what she or he heard to the next person. The whispers continue around the circle. Last person compares what she/he heard with the original statement. Hilarity ensues. Point taken: how little the statements resemble each other. Family stories can be vivid for “adding flesh to the ancestral bones” as we say. Lord knows, anecdotal evidence can be useful when trying to describe long-gone people in writing. But they are only stories, identified as such, until otherwise researched. We spend a lot of time trying to track down the truth behind stories-gossip-rumour handed down to us. And it sure ain’t ever easy, separating the wheat from the chaff. Example: An articulate cousin, at every family gathering, takes centre stage with tales of Highland glory and our imaginative descent from Simon Fraser the explorer. The indulgent audience is always rapt. I gave up arguing privately with him because I finally understood his need to repeat the fond stories without factual spoilers from me. Searching for the truth is an obligation that comes with the genealogy package—at the least, doing our best to verify the straight goods. Biographical writing of real, documented ancestors, even if it looks slim at times, is the result of intensive research. We pay tribute to the ancestors who contributed so much to make US who and what we are. Notice the emphasis on old family stories, and the passage of generations. How can we tell if the morphing into mythinformation began in mere carelessness or if more deliberate motives were at play? To my surprise and regret, I find bizarre family stories propagating in my lifetime about an ancestor whose life events I’ve researched in contemporary, original sources. I hear: rum-running during prohibition! Military honour awarded by the Queen in greatest secrecy! Murderous post-war hunting of Nazi criminals! Yowser. Sounds like an unwritten novel. Idle minds? Wishful thinking? Readers and GeneaBloggers, I ask you: Any similar experiences? Is there a moment when we stop proselytizing, if that’s what we’re doing, and forget the “audience”? Just work on family history for the sheer joy and peer support? If any family members are lurking along, remember you can comment anonymously! Or do I detect a movement to lock up the crazed genealogist in a computer-unfriendly environment? Any excuse for a photo! Dia de los Muertos is not dead yet for this year. All weekend Toronto's Harbourfront Centre celebrates Mexican historical traditions, honouring deceased ancestors among them.